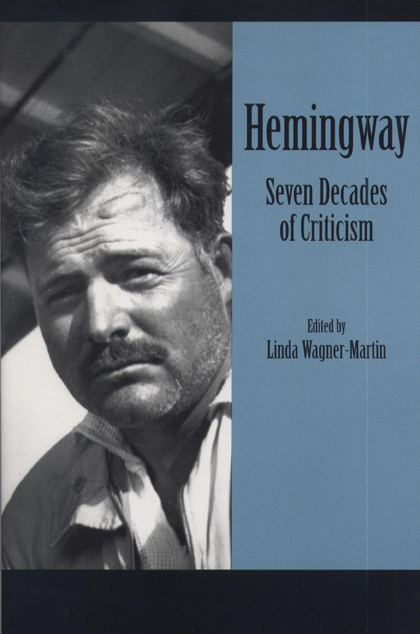 Once again Linda Wagner-Martin has selected an important collection of essays that cover some of the more interesting dimensions of Ernest Hemingway's fiction. Although the book opens with pieces from the 1920s by D.H. Lawrence and Gertrude Stein, it emphasizes criticism written during the past decade. In the 1980s and 1990s, Hemingway's fiction has sparked a renaissance of attention and critics have moved with alacrity beyond their earlier appreciation of Hemingway's style, economy, and grace. A retrospective look at criticism that appeared soon after the author's suicide shows a collection of writing that—from the perspective of the 1990s—seems hesitant. If Hemingway himself seemed to fault his life's work, perhaps the previously acknowledged brilliance of his writing might be called into question. Essays of the 1960s and 1970s dealt with small issues, close readings, and limited concerns. But, as the nature of the critical enterprise changed, so too did the kind of criticism devoted to Hemingway's words. Much of this collection presents the Hemingway oeuvre as culturally provocative, especially on the questions of gender, sexuality, and race; and, for the first time in the "decades" series, a great many of the essays have been written by women scholars. Linda Wagner-Martin holds the Hanes Chair of American Literature at the University of North Carolina, Chapel Hill. She has received Guggenheim, NEH, ACLS, and Rockefeller Fellowships and has served as president of the American literature section of the MLA, and as president of the Ernest Hemingway Foundation and Society.